Nearly everyone has experienced an insect bite or sting at some point in their lives. Most of the time, these stings and bites lead to mild pain or itching right where they occurred. Sometimes, however, people can experience more severe reactions that could be caused by an allergic reaction to the sting or bite. We will expand more on these allergies, but first it's important to note that not all "reactions" after an insect bite or sting are "allergic" reactions. Toxic reactions. Some insects inject substances (venom) which can cause a toxic reaction. The symptoms may appear similar to an allergic reaction, but the underlying mechanism is different. Serum sickness reactions. Yet another type of reaction which can occur with insect bites and stings is a serum sickness reaction. The symptoms may appear similar to allergies, but may also include symptoms that are similar to having a flu virus. Let's take a look at the different types of bites and stings. At the end of each of these sections is a link in which you can learn more about allergic reactions to specific insects. Most people who are stung by bees, wasps. yellow jackets, or hornets will develop a reaction at the site of the sting that will cause pain, swelling, redness , and itching. A smaller percentage of people—about 10 to 15 percent—also will experience larger areas of swelling, and the swelling can last up to a week. Less common are people who have full-blown allergic reactions that cause anaphylaxis. About 0.5 percent of children (1 out of 200) and 3 percent of adults will experience anaphylaxis after a sting from these insects. Learn more about reactions to bee stings including common symptoms, management and treatment, and tips on how to avoid being stung. Most people experience some form of reaction from mosquito bites—the typical itchy red bumps that last for a couple of days. Less commonly, more severe reactions can occur. These include blistering rashes, bruises, or large areas of swelling at the bite sites. People who experience extremely large areas of swelling after a mosquito bite (such as swelling of most of an arm or leg, for example) have been dubbed as having "skeeter syndrome." Rarely, anaphylaxis can occur as a result of a mosquito bite. Learn more about reactions to mosquito bites, skeeter syndrome, treatment and prevention methods, and tips on avoiding bites. Fire ants are aggressive stinging ants found most commonly in the southern United States. Almost everyone experiences some sort of reaction to a fire ant sting, the most common of which is a sterile pustule at the site of the sting. (A pustule is an elevated lesion similar to those found in chickenpox or acne.) A large percentage of people experience a significant amount of swelling, redness , and itching around the site of the sting (these are called large local reactions). About one percent of people can experience severe allergic reactions, such as anaphylaxis, as a result of a fire ant sting. 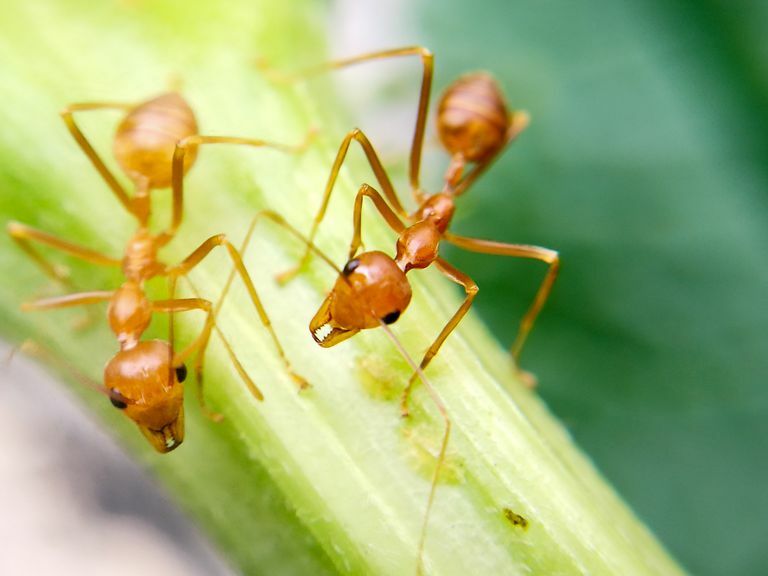 Learn more about reactions to fire ants. Bedbugs are flat wingless insects, typically of a brown or reddish color, about half the size of a dime. These insects are blood-sucking parasites, and they usually feed at night—mostly on people. Bedbug bites can appear as itchy, red bumps and are frequently confused with allergic rashes. The rash may be grouped in a line, which shows the pattern of the insect feeding. Learn more about reactions to bedbug bites and how to treat them. Scorpions are found around the world. They are not insects; they are arachnids and are closely related to spiders, mites , and ticks. Scorpions have the ability to kill prey by injecting venom from a stinger located at the end of a long tail. Because many scorpions are found indoors, people are frequently stung by scorpions. Scorpion stings are rarely known to sometimes cause allergic reactions, although in most cases, symptoms after a scorpion sting are caused by neurotoxins in the venom, leading to symptoms of numbness and tingling throughout the body. Learn more about reactions to scorpion stings. With tick bites, allergy isn't usually the primary concern. Rather, the transmission of diseases such as lyme disease and rocky mountain spotted fever may be your main worry. Yet allergies may occur. Bites from the lone star tick may cause you to develop an allergic reaction to meat. Insect bites and stings often cause significant discomfort and sometimes cause life-threatening anaphylaxis. There are many options, however, for reducing your risk. If you are at risk for anaphylaxis, it's important to recognize the early symptoms and have an Epi-pen on hand. Immunotherapy (allergy shots) can be helpful in reducing your allergic symptoms to many of these insects. If your allergy is severe, a type of immunotherapy known as rush immunotherapy offers a way to often cure your allergy in a shorter period of time than regular allergy shots. Dhami, S., Zaman, H., Varga, E. et al. Allergen Immunotherapy for Insect Venom Allergy: A Systematic Review and Meta-Analysis. Allergy. 2017. 72(3):342-365. Golden, D., Demain, J., Freeman, T. et al. Stinging Insect Hypersensitivity: A Practice Parameter Update 2016. Annals of Allergy, Asthma and Immunology. 2017. 118(1):28-54. Lee, H., Halverson, S., and R. Mackey. Insect Allergy. Primary Care. 2016. 43(3):417-31.